When it comes to instant cameras, Polaroid is often the first brand that comes to mind. Edwin Land originally created the Polaroid company to explore his passion for inventing. After creating the first instant developing film in 1948, the Polaroid company continued to innovate the film camera industry. The Polaroid company has steered away from film in recent years, but that hasn’t stopped them from creating new, exciting instant camera options. In this article, we will dive into the Polaroid brand to learn more about how their cameras have evolved throughout the years. Before we dive into which Polaroid is best for you, let’s go over some of the most frequently asked questions about Polaroid Cameras. Who Invented the Polaroid Camera? Edwin Land released the original Polaroid camera in 1948 after a question from his daughter prompted him to invent the first instantly developing film. The idea originally came to Land in 1944, after his 3-year-old daughter asked why she couldn’t see a photo that he’d taken of her immediately. Four years later, his company Polaroid released the world’s first instant film camera, 95 Land Model. In the years after the 95 Land Model, Polaroid continued to innovate in the instant camera market. It was only a few years later in 1963 that Polaroid introduced the Polacolor film, the first color film to work with an instant camera. 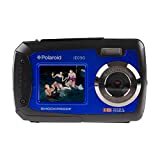 In 2008, Polaroid announced that it would stop making film new cameras, and turned their efforts to instant digital cameras, waterproof cameras, and camcorders. However, they still offer a classic instant film camera through a company known as The Impossible Project. How does a Polaroid Instant Film Camera Work? Film photography is based on a chemical reaction created when the photo film is exposed to light. When a photo is captured, you can develop the film negatives using specific chemicals known as dye developers that will trigger another chemical reaction. This chemical reaction caused the developers to stick to the image in certain patterns based on how the light reflected onto the film. Instant film, originally invented by Polaroid founder Edwin Land, stores all of the chemicals needed for development right into the print. Instant film contains multiple layers of chemicals that are needed to develop the print, which are released when the camera prints the photo out. This forces the chemical reaction to take place, and the film develops in a matter of seconds. What Kind of Film does a Polaroid Camera Need? You can buy Polaroid film on the Polaroid site, or through an online retailer like Amazon. Many modern Polaroid digital instant cameras don’t require film, and, instead, use a heat sensitive paper to create digital copies using their Zink Zero Ink technology. Make sure your camera takes actual film prints before purchasing any online. What is Zink Zero Ink? Zink Zero Ink is a special technology used in modern Polaroid Instant Camera that allows photographers to print out digital photos without the use of ink cartridges or toner. Paper treated with Zink Zero Ink technology has multiple layers with cyan, yellow, and magenta dye crystals beneath a protective overcoat. Polaroid cameras used heat to activate these crystals and perfectly recreate a digital photograph. Features – We took a look at the features that each Polaroid camera offer to see which camera is the best for each situation. Photo Quality – If you’re spending money on a camera, you want the picture to look good. We took a look at the photo quality of each camera to make sure. Design – Poor camera design can get in the way of shooting your photos. We tested out each camera to make sure the design makes sense. Price – While price isn’t the only thing that matters when it comes to getting the right Polaroid camera, it’s important to keep in mind. The Polaroid Snap is a modern take on the original Polaroid instant camera. Rather than using classic instant film, the Polaroid Snap captures digital images that can be transferred to small prints. When a photo is taken, the Zink Zero Ink printer technology will instantly print out a 2”x3” copy of the photo. It comes with a 38GB memory capacity and a small internal memory that will store all your photos. These photos can be uploaded them to your computer or smartphone. The Polaroid Snap only has a 10-megapixel image sensor, which doesn’t make it much better than any modern smartphone camera. It also lacks any zoom and flash capabilities, which limits what you can do with your photos. You can shoot in three modes: color, sepia, or black and white. The Snap also gives you the option to add the classic Polaroid border to your prints. The Snap has a very simple design, making it very simple to pick up and start shooting at any time. It comes in 5 different color options: black, white, purple, blue, and red. The Polaroid Snap is available on Amazon. The Polaroid Snap Touch is an upgrade from the Snap with 13-megapixel camera and a touchscreen LCD. The LCD screen is used to control the camera, and can also be used to preview the photo before taking the shot. That way you know exactly what the photo is going to look like before it prints. Polaroid also added flash and zoom features, and a movie mode that can record full 1080p HD videos. They also upgraded memory capacity it can store up to 128GB of data on an SD card, giving it a huge advantage over the Snap’s 38GB. It also features Bluetooth connectivity, so you can easily upload photos without having to manually export them. The Polaroid Snap Touch has the same three photo modes as the Snap: color, sepia, or black and white. It offers no other photo options, besides the Polaroid border carried over from the Snap. The Snap Touch comes in 6 different color options: black, white, purple, blue, red, and pink. The Polaroid Snap Touch is on Amazon for around $140 to $150. The Polaroid POP looks different from every other instant camera on the market, with it’s smooth and memorable square design. It uses the same Zink Zero Ink technology as the Snap line, but offers a higher 20-megapixel sensor that can print 3.5”x4.25” full color photos. It also has 1080p HD video capabilities, including a fun mode that allows you to create GIFs. Like the Snap Touch, the Polaroid Pop has a memory capacity of up to 128GB. 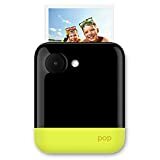 You can use the touchscreen on the Pop to decorate your photos with stickers, boarders, and even drawings before you print them out. This is a fun way to customize your prints, which can be given out as small gifts or saved in a scrapbook. The Polaroid POP Instant Digital starts at $95 on Amazon. FEATURES: The built-in strobe flash and high-quality 2' to infinity lens, you can be sure every shot is simply amazing. LENS: High-quality fixed focus lens (2 ft - ∞) with a focal length of 106mm. The Polaroid OneStep 2 Viewfinfder i-Type the one of the last instant film cameras offered by Polaroid through The Impossible Project. A modern update of their original design, the OneStep 2 combines a nostalgic feel with all the technology that Polaroid has innovated over the years. The OneStep 2 is easy to use, with only a few buttons to work with. It features a large red shutter button, flash suppression button, and EV compensation switch. It also has some modern features such as a rechargeable battery and USB connectivity. This camera is great for people who are looking to share some fun memories with friends and families. While not a professional camera, newbies and veterans can agree there is something magical about watching film develop in front of your eyes in an instant. However, film for the OneStep 2 can be expensive, starting at $15.99 for a pack of 8 sheets. The Polaroid OneStep 2 Viewfinfder i-Type is available on the Polaroid online store. Or you can get it from Amazon for around $140 to $150. With its affordable price and quirky design, the Polaroid PIC-300 is a great camera for those who still long for the classic instant camera experience. It comes in four different colors: black, blue, purple, and red. The PIC-300 comes with a surprising amount of features, given that it’s the lowest priced camera on the list. Along with flash and an extending lens, the PIC-300 also has four different lighting modes. When a picture is shot, the photos are developed on print no larger than a business card and will develop in less than 60 seconds. This is a great, inexpensive camera with all the novelty of the instant camera we know and love. It’s a great travel accessory, and can be used by just about anyone, even kids. The Polaroid PIC-300 is priced in the range of $65 to $70 on Amazon. While not technically a full camera for taking professional photos, the Polaroid Cube is still a punch for its small size. The Polaroid Cube was made to be a competitor to the GoPro, as it can be taken just about anywhere to be used for pictures or videos. The Cube can shoot at either 720p or 1080p, and has space for a microSD card of up to 32GB. The Polaroid Cube is easy to use, lightweight, and can be mounted on anything that’s metal with its magnetic bottom. While it only has a battery life of about 90 minutes, the Cube can be easily recharged by USB connection for when you’re on the go. The Polaroid Cube starts at $99 on Amazon. The Polaroid iS2132 is a 16-megapixel camera with a powerful, 25mm wide-angle lens that offers a 21x zoom. It also has many features that you can find in modern DSLR cameras, such as a good ISO range, pop-up flash, and auto focus illuminator. Polaroid’s take on the enhanced optical zoom camera may look like a DSLR, but it lacks many of the customizable photo features that today’s DSLR cameras come standard with. For example, the iS2132 does not have an optical viewfinder, HD video recording capabilities, or any Wi-Fi connectivity. This doesn’t mean that the iS2132 isn’t worth checking, especially for those who are looking for a professional grade camera without having to shell out hundreds of dollars. The Polaroid iS2132 is available on Amazon for about $175 to $199. 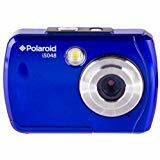 In recent years, Polaroid has been working on a small line of inexpensive digital cameras that can be used anywhere, including the water for up to 10 feet. The Polaroid iS048 is the cheapest of the models, and comes as a bare-minimum yet versatile camera. The iS048 is able to take high-quality images and videos using its 16-megapixel camera. There is no zoom, so you will have to be close to a subject to get a clear shot. While the pictures may not come out as clear as some of the other cameras on this list, it may be worth checking out if you’re just looking for an inexpensive camera you can use to snap some great vacation pics. 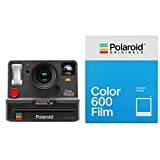 The Polaroid iS048 starts at $39.96 at Walmart. It is also available on Amazon with a price range of $45 to $50. 1.8" Front Screen lets you preview your images and videos in a snap - perfect for selfies! The Polaroid iS085 camera is for those who want an inexpensive waterproof camera with some cool capabilities. It’s similar to the iS048 in specifications, with a 16-megapixel camera that lacks the ability to zoom in. However, it differs from the iS048 in the addition of a seconds screen on the front of the camera. This allows you to preview a shot before it’s taken, no matter what side of the camera you are on. The Polaroid iE090 starts at $65.95 on Amazon. The Polaroid iXX090 is a step up from the iE090 that gives you a sturdier camera for an on-the-go lifestyle. Along with waterproofing up to 10 feet, the iXX090’s design is sturdy enough to be shockproof, dustproof, and freezeproof. This makes it the most durable camera Polaroid offers. Polaroid also outfitted the iXX090 with an upgraded 20-megapixel sensor, and added 4x digital zoom capabilities to help you get closer to your subject for a clearer shot. It features the same dual LCD screens, along with a single MicroSD card slot. The Polaroid iXX090 is available at Walmart.